Chem-Dry Kishwaukee is your best choice for cleaning in Rochelle, IL because we use our proprietary hot carbonating extraction cleaning process that combines innovative cleaning solutions and industry-leading equipment. Our technicians will deliver a cleaning that’s not only safe for your carpets, rugs and upholstery, but gives you the peace of mind of knowing you have a clean, refreshed home that is healthier for you and your family. We invite you to learn more about the benefits of Chem-Dry Kishwaukee’s carbonating cleaning process and green-certified solutions that are safe for your kids and pets. Call today for a free quote. 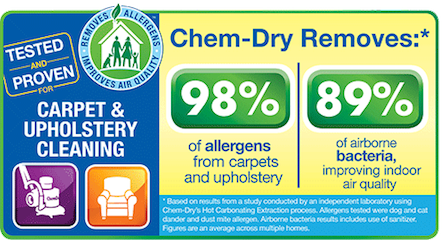 Chem-Dry Kishwaukee’s cleaning process is better and healthier than other methods for your carpet and upholstery cleaning. Chem-Dry Kishwaukee’s unique hot carbonating extraction carpet cleaning method uses the power of carbonation to extract more dirt and grime from your carpets, giving them a deeper and longer lasting clean. Our carbonated cleaning solution only requires us to use a fraction of the moisture other methods such as steam cleaning require. This allows your carpets to dry faster, typically in 1-2 hours. All of the ingredients in Chem-Dry Kishwaukee's primary cleaner, The Natural, are on the F.D.A. 's G.R.A.S. (Generally Recognized as Safe) list and are safe for your carpets, your home and your family. The Natural does not contain any soaps or harsh chemicals. This is not necessary. Chem-Dry Kishwaukee’s professionally trained carpet and upholstery cleaners will vacuum your carpets with our commercial, HEPA-filtered vacuum when they arrive as a standard part of our service. Drying time depends on humidity levels, airflow to the room(s) cleaned, and the type of carpet. In general, turning on your air conditioning or fans will help accelerate dry times. After a Chem-Dry Kishwaukee professional cleaning, it typically takes 1-2 hours for the carpet to dry. Sometimes carpets can take longer to dry for various reasons.